We have been closely monitoring the progress of the search for the elusive “Higgs Boson” particle—presumptuously dubbed the “God Particle” by many scientists (see Miller, 2011a and Miller, 2011b for previous discussion). The hunt has been a roller coaster ride, with scientists thinking they have found the particle and then changing their minds time and again. The Higgs Boson particle is “thought to be the fundamental unit of matter” (“Has Quest for the Elusive…?” 2011). In theory, it could explain how other elementary particles have mass. The particle is a theoretical elementary particle that is predicted by the Standard Model of particle physics, but which had yet to be observed by physicists through experimentation, until now—or so scientists hope. 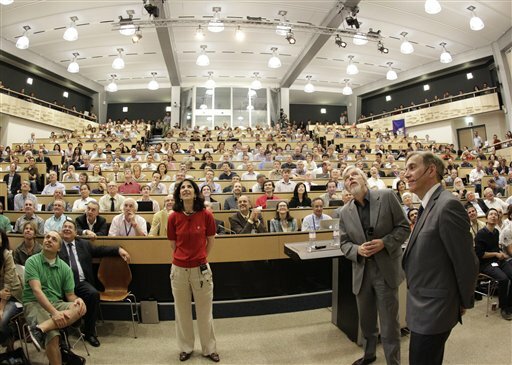 Scientists awaiting the latest update in the search for the Higgs Boson at the European Organization for Nuclear Research, July 4, 2012. On July 4, 2012, scientists sent shockwaves through the world as they announced that they believe, with well over 99% certainty, that they have found the Higgs Boson particle using the Large Hadron Collider (LHC), a particle accelerator located in Switzerland (“The Elusive Particle…,” 2012; see May, 2012 for more information on the LHC). How significant is this find to the believer? If there is a “God Particle,” does that mean the “Big Bang” is true? Does it mean that this particle can create matter? Does it mean that there is no God? Why do many call it the “God Particle”? Technically, according to the National Post, the name “God Particle” is an abbreviated form of its original, profane designation—“The God-d*** Particle” (a name used by Nobel physicist Leon Lederman as a draft title for a book), referring to the frustrations scientists have been going through trying to find the Higgs Boson. So, it actually had nothing to do with God. Apparently, however, the name was abbreviated to “The God Particle” to avoid offending readers—as though the abbreviated description is any less profane (“Higgs Boson Hunt Over…,” 2012). The result of this name designation has been to give the impression that the particle is “God-like” and somehow eliminates the necessity of a God in creating the Universe, while substantiating the Big Bang Theory. So, to Big Bang-believers today, the Higgs Boson is not just an energy particle which they believe gives an object its mass, but rather, it is “a theoretical energy particle which many scientists believe helped give mass to the disparate matter spawned by the Big Bang” (“Scientists Close In…,” 2010, emp. added). Big Bang theorists consider its existence “crucial to forming the cosmos after the Big Bang” (2010, emp. added). Therefore, the particle is “god-like” to such sadly deluded individuals, since it, in theory, “gives mass” and helped “form” the cosmos. 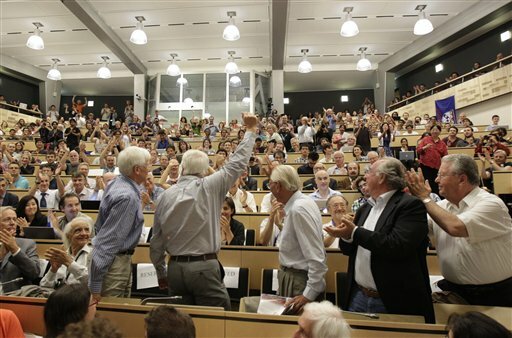 Former CERN director general Christopher Llewelyn-Smith, standing left, Lyn Evans, scientific director, standing second left, Herwig Schopper, standing center, Luciano Maiani, standing second right, and Robert Aymard, standing right, wave after the presentation of results during a scientific seminar to deliver the latest update in the search for the Higgs Boson. In reality, the existence of the Higgs Boson in no way eliminates the need for God. Consider the following. In the 1600s, Creation scientist Isaac Newton, after observing an apple falling to the ground, “deduced that the same force which caused the apple to fall to the ground causes the moon to orbit the Earth” (Pinaire, 2000). From this concept, in time, Newton formally articulated what we now call “Newton’s Laws of Motion,” the second of which says, in essence, that the force an object applies is equal to its mass multiplied by its acceleration. So, an object’s weight on the Earth (i.e., “applied force” on the Earth) is equal to its mass times its acceleration (i.e., the acceleration due to gravity at the location where the object is on the Earth). Question: By discovering gravity, did Newton discover the “God Force” that keeps humans tied to the Earth? Did he disprove the need for God? Certainly not, and no one even suggested such an idea. He merely discovered one of the characteristics of the created order—one of the “ordinances” that God set up to have “dominion over the Earth” (Job 38:33). 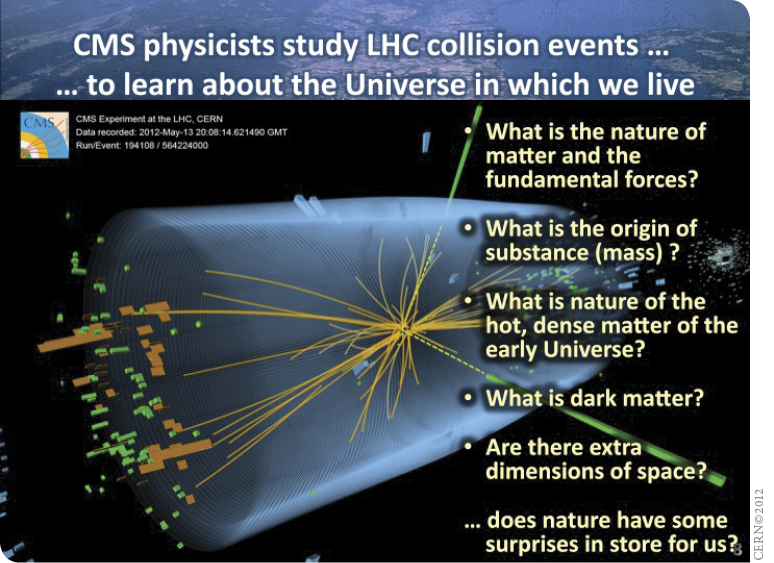 A di-photon event from a Compact Muon Solenoid (CMS) experiment in search of the Higgs Boson. Also, the purpose of studying LHC particle collision events, according to teh European Organization of Nuclear Research (CERN). According to Rolf Heuer, the director of the European Organization for Nuclear Research (CERN) (the research center that houses the LHC), whether or not scientists have truly discovered the Higgs Boson still needs to be verified. Heuer said, “It’s a bit like spotting a familiar face from afar. Sometimes you need closer inspection to find out whether it’s really your best friend, or your best friend’s twin” (“Higgs Boson Hunt Over…,” 2012). Assuming the find truly is what it purports to be, the particle will simply be another step in expanding our understanding of how God set up the Universe. Newton discovered that force is equal to mass times acceleration. But the logical next step is to answer questions like, “How is there mass? What gives an object mass?” If scientists’ theory is correct, the Higgs Boson will simply help shed light on those questions—i.e., how did God set up the Universe in such a way that an object has mass? In other words, the Higgs Boson may help us to understand more about how God “framed” “the worlds”—showing us more about how “the things which are seen were not made of things which are visible” (Hebrews 11:3). Also, the existence of the Higgs Boson in no way violates the First Law of Thermodynamics (i.e., creating energy or matter from nothing). In nature, nothing can be created or destroyed, but can only change forms, according to the First Law of Thermodynamics (Miller, 2007). So, only a Supernatural force can create something out of nothing. The Higgs Boson particle is not God. And further, the existence of the Higgs Boson in no way disproves the existence of God. Someone had to create the Higgs Boson in the first place. And the existence of the Higgs Boson in no way verifies the Big Bang Theory, which is riddled with problems—as atheistic scientists themselves highlight frequently (see, for example, the recent article in New Scientist titled, “Bang Goes the Theory” [Gefter, 2012]). As stated above, evolutionists consider the existence of the Higgs Boson “crucial to forming the cosmos after the Big Bang” (“Scientists Close In…,” 2010, emp. added). Notice that without the existence of this particle, Big Bang theorists recognize that the Universe could not even form after the Big Bang theoretically occurred. Its existence does not prove that the Universe did form in the manner suggested by the Big Bang Theory. Its existence does not even prove that the Universe could form after a hypothesized Big Bang occurred. Further, its existence does not prove that the Big Bang itself could occur at all. Its existence does not prove that matter could exist forever or pop into existence out of nothing, either one of which must be true in order for the Big Bang even to get started. And its existence certainly does not prove that the scientific laws governing the Universe could write themselves into existence. However, without the existence of the particle, theorists know that fundamental tenets of the Big Bang Theory could not happen. It’s another thing to say that they could happen. Thus, the discovery of the particle’s existence does not prove anything in the end, but only allows atheistic cosmologists to cross one of the many chasms that stand in the way of their theory even getting to the starting line in being considered a remote possibility. In other words, the Big Bang has not even reached square one in the realm of proof. It remains firmly in the realm of impossibility. Bottom line: the Creation model still stands as the most logical explanation for the origin of the Universe—the model that is in keeping with all the scientific evidence. Much more is missing in the quest to substantiate the Big Bang than a little particle can solve, and the list of those missing entities continues to grow, and will continue to do so, until true science—science that is in keeping with the evidence—is allowed to flourish. It has become increasingly popular for cosmologists to label many of these missing “somethings” with the first word, “Dark.” The list of “dark,” missing entities is growing. In truth, if the scientific community would only let the “light” of truth into the picture, the darkness would disappear. “The Elusive Particle: 5 Implications of Finding Higgs Boson” (2012), Fox News, July 5, http://www.foxnews.com/scitech/2012/07/05/elusive-particle-5-implications-finding-higgs-boson/. Gefter, Amanda (2012), “Bang Goes the Theory,” New Scientist, 214:32-37, June 30. “Higgs Boson Hunt Over: CERN Scientists at Large Hadron Collider Find ‘God Particle’” (2012), National Post, July 4, http://news.nationalpost.com/2012/07/04/higgs-boson-hunt-over-cern-scientists-at-large-hadron-collider-find-god-particle/. 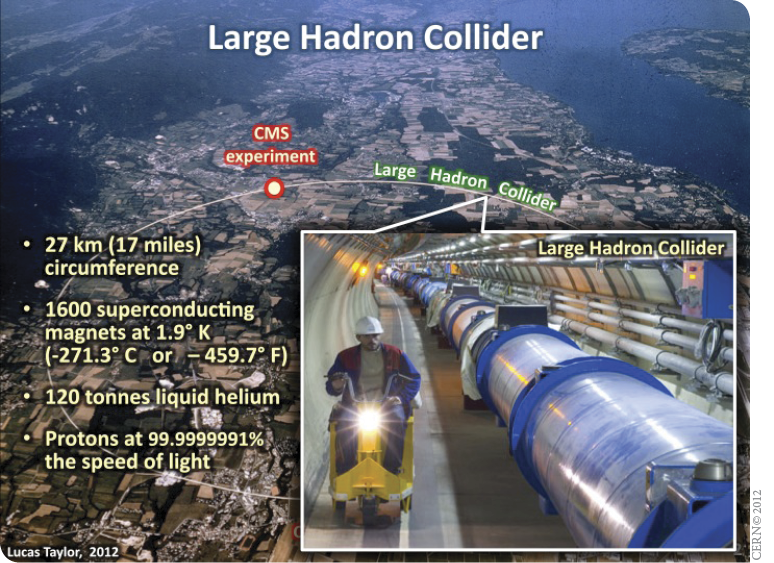 May, Branyon (2012), “Is the Large Hadron Collider a Big Bang Machine?” Reason & Revelation, 32:38-45, April, http://www.apologeticspress.org/apPubPage.aspx?pub=1&issue=1026. Miller, Jeff (2011a), “Higgs Boson–the ‘God Particle’?” Reason & Revelation, 31:53, http://www.apologeticspress.org/apPubPage.aspx?pub=1&issue=977&article=1500. Miller, Jeff (2011b), “Higgs Boson–Update,” Reason & Revelation, 31:101, http://www.apologeticspress.org/article/4120. Pinaire, Chris (2000), “Isaac Newton,” Wichita State University Department of Mathematics and Statistics, http://www.math.twsu.edu/history/Men/newton.html. “Scientists Close In on God Particle” (2010), Fox News, July 27, http://www.foxnews.com/scitech/2010/07/27/scientists-closing-god-particle/.